Those who thought Justin Bieber would disappear after a couple of months were mistaken. Despite still being a teenager, he's an entertainment juggernaut, selling out stadiums around the world. 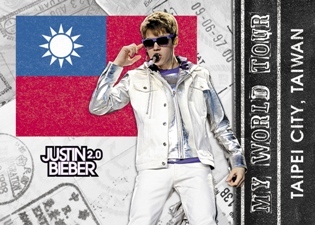 Panini's second set of trading cards, Justin Beiber 2.0, offers more Bieber pictures and trivia. Panini has also inserted random autographs and three different memorabilia cards. Five prize redemptions will award collectors with full pieces of clothing from Bieber's laundry basket. 100-card base set provides tons on in-depth details on the teen singing sensation. Also includes three separate nine-card puzzles. 30 stickers inserted one per pack, split equally between images and either song titles or slogans. Autographs and three different Memorabilia Cards randomly inserted. Five collectors will win a full piece of Bieber-worn clothing.